Some of our Italian friends will tell us off for using cream, but we thought this recipe from Ferran Adrià was delicious. We cooked this for two but you can also make it for 6, 20 or even 75 people! We’ve given the quantities here for 2 and for 6 people. Remove the rind and cut the bacon into small strips. Put a large saucepan over a low heat, then add the oil and bacon. Fry gently for 10 minute or until the bacon has browned. Reserve one-eighth of the cream and add the rest to the bacon. Simmer for 20 minutes. Season well with salt and pepper before removing from the heat. Bring the water to the boil, add the salt, and cook the pasta according to the pack instructions. Whisk the egg yolks together with the reserved cream. Drain the pasta and return it to the pan. 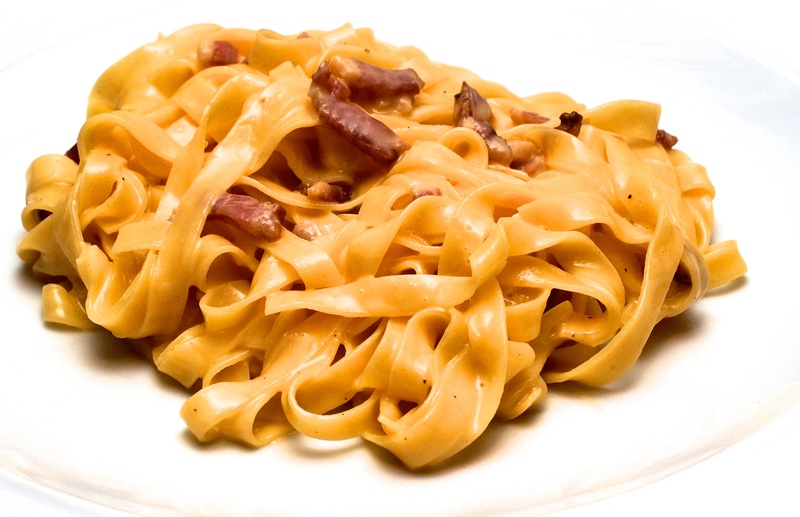 Add the bacon cream to the pasta. Stirring constantly, add the egg yolk mixture. The eggs will thicken a bit and will coat the hot pasta. Wine Suggestion: The key to pairing this dish is to provide both acidity and texture in a medium weighted wine. There are some fascinating southern Italian white wines that have been macerated on their skins that may suit, or in contrast an oaked Sauvignon Blanc from the Loire would also work well. If you feel like a red go for a lighter, young and unoaked red made from Cabernet Franc or a blend that includes Sangiovese.